Do not rub your eyes or you will disturb the bandage contact lens. If you have pain you may take pain medications or use "Comfort Drops". Avoid eye makeup and swimming pools/hot tubs for the first 5 days or until the bandage contact is taken out. Allow 5 minutes between drops so each drop can be absorbed. Medications start after you get home for surgery. Click for instruction on how to put drops in your eye. EconoPred Plus - 1 drop 4 times a day. Tobradex - 1 drop 4 times a day. Nevanac - 1 drop 4 times a day. Refresh Liquigel - use as needed probably at least 4 times a day. Comfort Drops - use 1 drop as needed for substantial pain. Use sparingly. Expect your vision to be blurry. Your bandage contact lens will stay in for about 5 days. Each day your eyes will feel better and returning to normal. We will ask you to return on postoperative day 4 or 5. Following that, Dr. Brems will determine your visit schedule and advise you when to return. 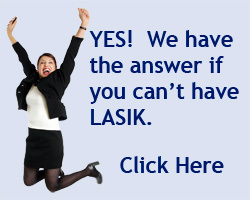 The surgery fee will cover all LASIK-related postoperative appointments for one year following the procedure.